Online entry at Ultra Signup.com is open!!! The fee schedule is $65 for Huntsville Track Club members and $70 for all other registrants. Runners who have completed Mountain Mist 10 times or more are guaranteed entry anytime during online registration period at the standard rate of $70 ($65 if you are an HTC member). If we reach capacity and you fall into this category and have not registered, please email eric.charette@yahoo.com for special instructions. A list of the 10+ time finishers is noted below. Registration will close on December 31 or when our registration capacity has been reached. At that time we will be checking qualifications for each runner. Friday before raceday from 5:00 - 8:00 p.m.
Saturday, raceday morning, from 6:30-7:30 a.m. Runners finishing under 8:15:00 will receive a special Smokey Mt. slate finishers' award! Pick up finisher award inside the Lodge at the awards table. 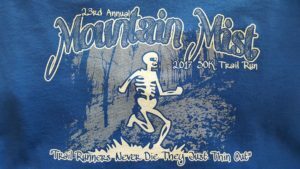 The pre-race dinner will be held at the Monte Sano Lodge, Friday night at 6:00 p.m. During the dinner, guest speakers answer questions, describe the course in detail and share stories of past years. There will be a post race party at a location to be determined. This is not included in the entry fee.